For the past year or so I have been using this site to review cars I’ve hired. Whilst that has been a lot of fun, I don’t expect to be hiring cars much any longer. And that is because of the car you see in the photo below. 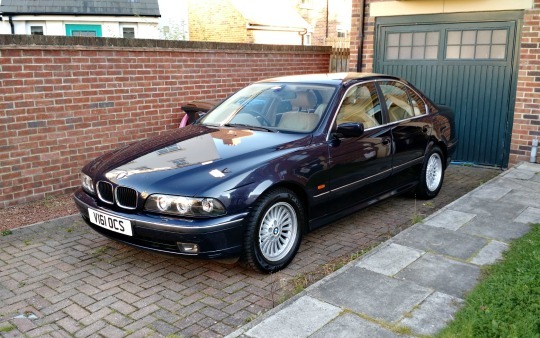 That’s right, I’ve gone and bought myself a 1999 BMW 528i. As a result, this site is going to undergo some changes. On the occasions when I happen to hire a car, I’ll continue to post reviews, but I’ll also use it to post stuff related to the BMW, such as details of repairs and maintenance I carry out, links to things of interest from the automotive world, and perhaps the occasional opinion piece. I’ve also started up a Twitter account with a purely automotive focus, so if you’re interested in that kind of thing, you can find me @jakebeldercars. About a year ago, this site started out as a place for me to review cars I hired. In 2010-11, I worked as a driver for Hertz, and had the opportunity to drive all kinds of cars. At that point, I started posting photos of the cars on Facebook with short reviews, just for fun. A year later, I moved to England, and because I lived in a place where I could get by without a car, I started hiring cars when I needed them. Hiring cars is a great way to test out new vehicles, and you generally get to try quite a variety (although I am too frequently given the keys to Vauxhall Astras). Because I had enjoyed doing it before, I decided to keep up the practice of reviewing them after I had driven them, and a blog devoted to that kind of thing seemed like a good idea. However, I now own a car, and as a result the frequency with which I hire cars is much less. So I have turned this site into a place for me to post an assortment of automotive things, sort of like an online automotive commonplace book. You can primarily expect to see things about my own car, or the occasional opinion piece. I’ll also use it to share interesting things I stumble across online. You can find me on Twitter @jakebeldercars.